"These make a special breakfast on cool fall mornings. My boys loved to help me cook a batch up for a 'breakfast for supper' night around Halloween. Use any and all decorations you like to make jack-o-lantern faces on the pancakes. Try broken candy bar pieces, banana slices, raisins, crasins, or chopped nuts." Stir together flour, oats, brown sugar, baking powder, cinnamon, cloves, and salt in a large bowl. In a separate large bowl, lightly beat together the milk, egg, pumpkin, and oil. Stir flour mixture into the pumpkin mixture, blending just until moistened. Pour batter, 1/3 cup at a time, onto the prepared griddle. 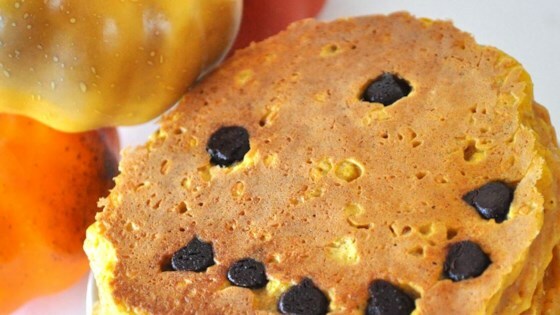 Make a jack-o-lantern face in each pancake with the chocolate chips. Cook until bubbles appear on the surface, then flip and cook until golden brown on the other side, about 5 minutes per side. These were VERY hearty. I don't think it's really something my family will go for again, but if you you like something that sticks to your ribs this is great. Even my picky kids will eat these. They are awesome!